Welcome to Fotopod! Rent - Welcome to Fotopod! From Booking Your Own Fotopod! A Picture Really Does Speak Louder Than Words! 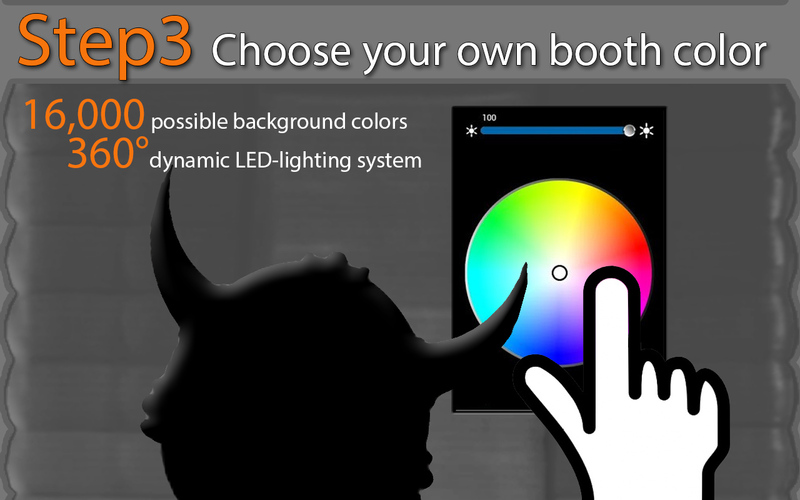 Once you step into a Fotopod Booth, you will be surrounded by studio quality LED lighting. The perfect setup for great photos and videos! Product suitable for ages 1-101 years of age. Results will vary from fun to crazy hilarious. No former posing experience necessary. Your package comes complete with our patented, inflatable “16 million color” LED glowing Fotopod booth…that holds up to 17 people! Our photographic 360º “softbox” lighting technology will BLOW your mind! 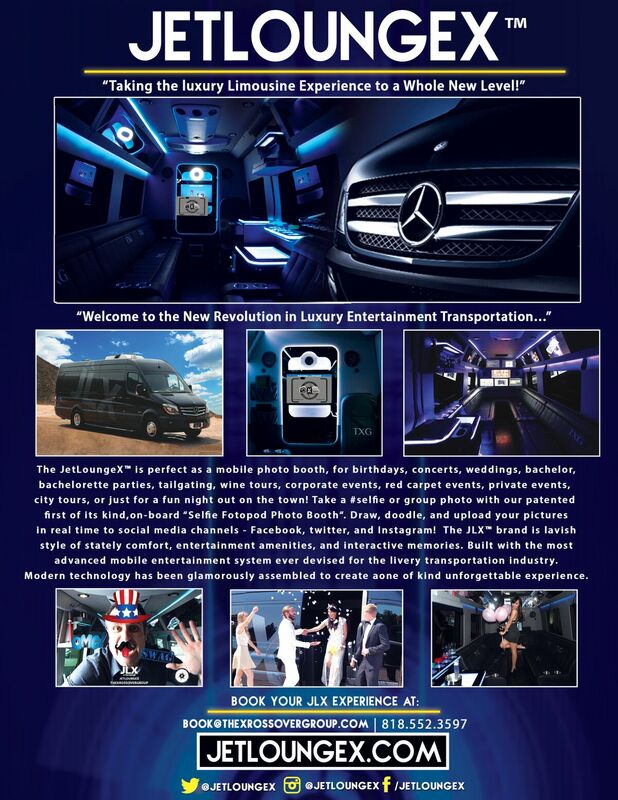 Check out below to see what our rental package includes. 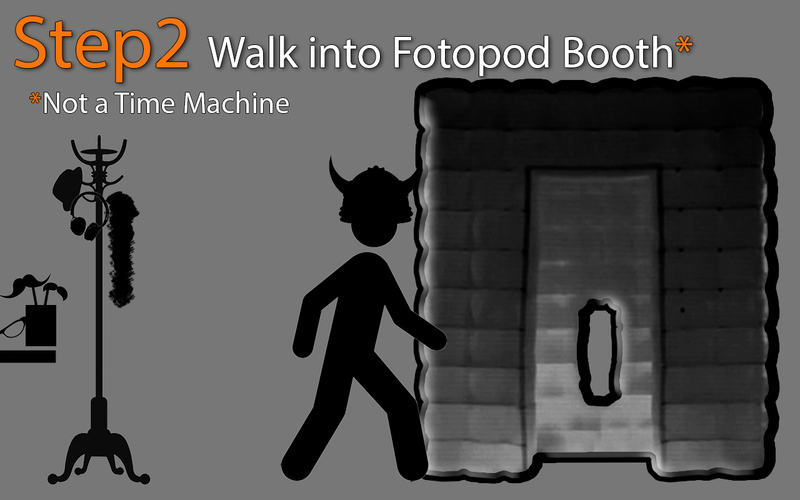 Question: Will the Fotopod Booth fit in our event? It’s a tight space! Answer: Yes. The only space we could not fit Fotopod was on a yacht. (Other obstructions are low ceiling fans/chandeliers, mud, grass, and hot volcanic rocks) Click here to see our recent FB galleries! Ask us about our new 80″ inch projection “Live-view” add-on! 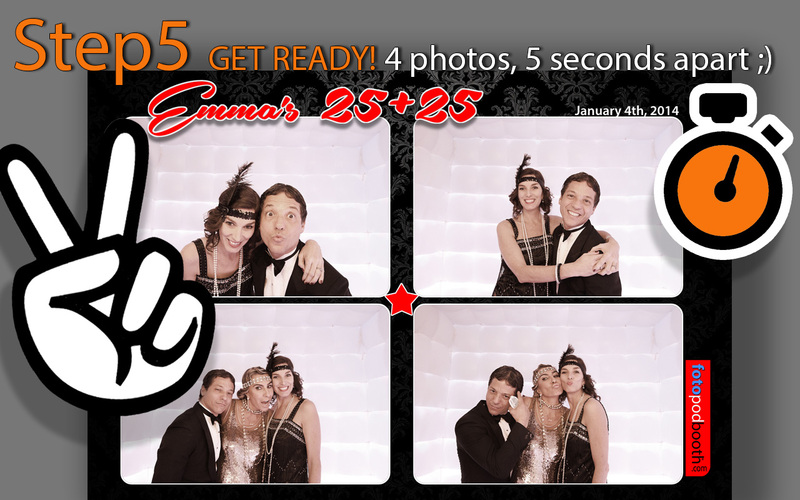 We only ROCK our latest, cutting-edge Photo Booths at your events! Choose from three different tiers! With our Fotopod Booth packages below, you can get it ALL! Prices fluctuate depending on weekday, weekend and seasonal availability. If you have a coupon code or discount flyer, we will be happy to honor that. Go ahead and take a moment to call us now. We will do our best to offer you a super rate for your next event date. Our inflatable-booth membrane is lit by internal waterproof and shatterproof custom LED-light panels. Simply speaking, with this setup, anyone can customize their own lighting mood! Guests have control over 16,000 colors to choose from using the touchscreen monitor. The colors are bright, vivid, and natural which brings the photo to a higher level of quality. This custom designed machine is the heart of our Fotopod Booth. Our machine helps and directs guests in taking their photo. It folds in half and sets up in no time. The housing contains a Digital Single Lens Reflex (DSLR) quality camera, two touchscreen monitors and a dimmable LED light panel. 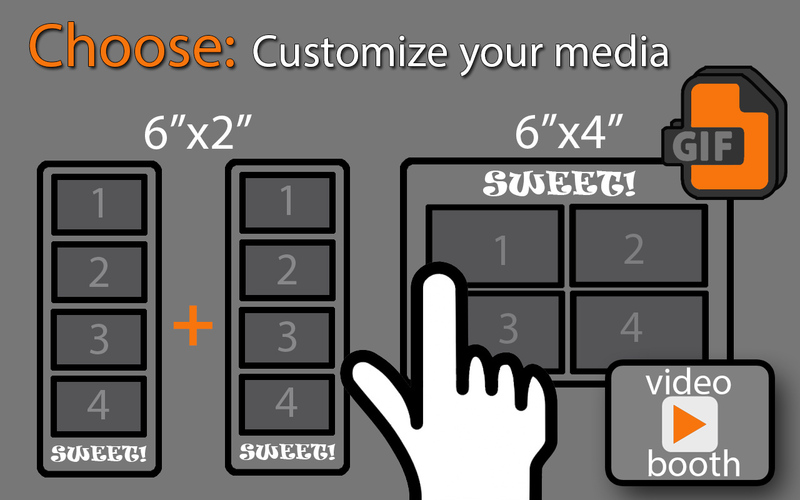 Step-by-step instructions will appear on the screen inside the booth. The guests will no longer need to bend down or stand up on chairs or benches since this machine has a built-in electric lift. The machine will adjust to your height at a touch of a button. With our Photo Station, guests will spend more time posing and having fun, and less time trying to fit everyone into the picture. Our machine can also rotate 180° to take photos of even larger groups of people. The iPad station serves two purposes. 1) It shuttles guests away from inside the booth, therefore, there are no more long lines waiting to take your picture. 2) With the popularity of social media, guests have the ability to view all of the event pictures, edit/delete, and instantly send them to Facebook, Twitter, or email. New!! Choose the GIF animation add-on, and view your animated photos straight on the iPad! You can now share it with your friends and family instantly! 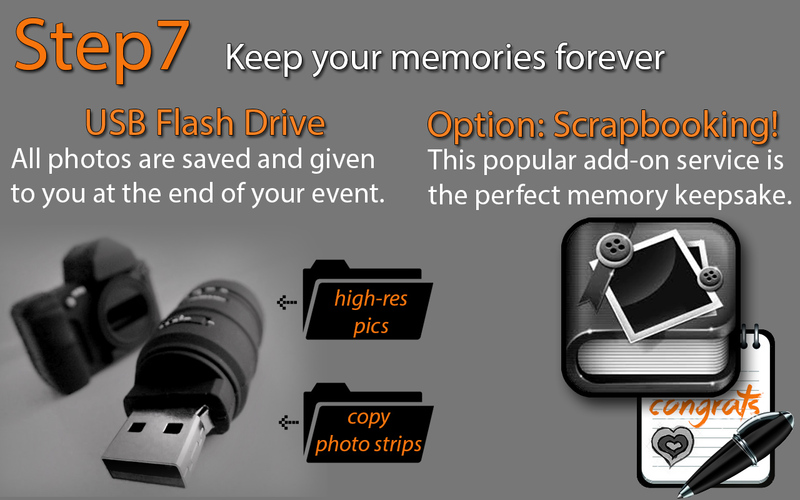 No more sleepless nights waiting for your photos to be emailed to you. We are all about instant accessibility! Since we are professional designers at heart, custom graphics and logos are available for your photo strips and touchscreen splash page. Need a logo to be placed on your printed photos? Yes, we can. Need a certain hashtag displayed for all your guests to see? Yup, all included. We don’t stop shop ’till your happy with your customized prints and graphics. 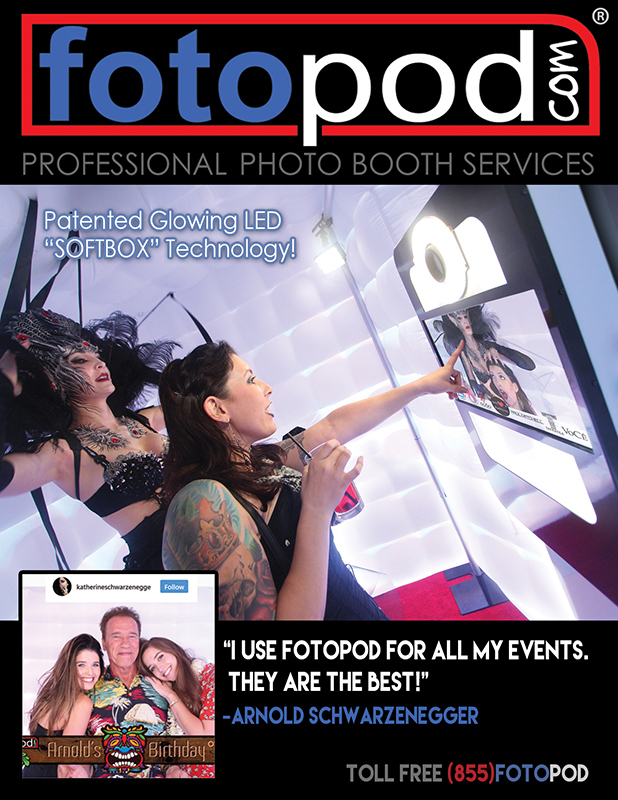 Please call or email us with some of your ideas or theme, and Fotopod Booth will spice it up! We offer professional quality prints using Dye Diffusion Thermal Transfer (also known as D2T2). This is a high-end technology of digital printing. This is not your mother’s ink jet printer. Your prints have a special over coating, a type of waterproofing, which greatly lengthens the photo storage time up to 100 years. Prints are developed within 12 seconds. 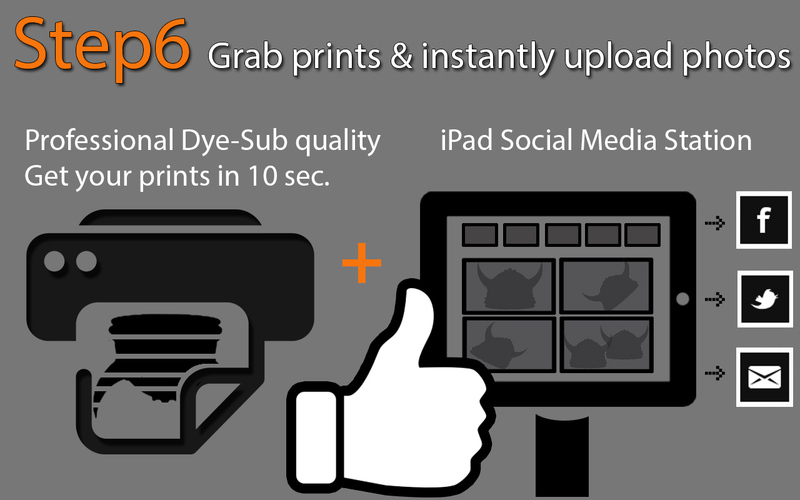 (Imagine, high quality prints for your following generations to enjoy!) You can also choose from many print template options. 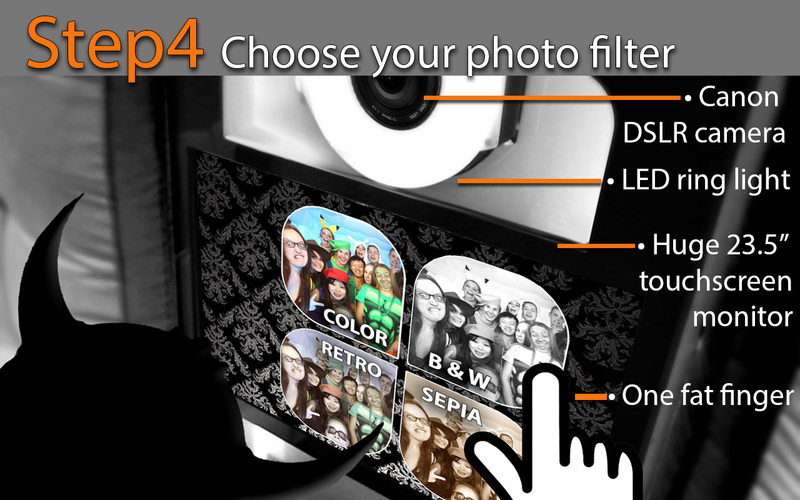 “Live-View” is definitely a cool gathering place for guests to view the latest and greatest Fotopod Booth photos! Our live-view monitor serves two purposes. 1) Guests waiting outside the booth can see a “live” real-time display of what’s happening on the inside. 2) The monitor can switch into screen-saver mode and has the capability of showing a dynamic slideshow of the event photos. What is a photo booth without the addition of props? We visited the many Hollywood studio prop shops in order to bring you a vast array of party props, cool hats, colorful boas, etc. To say the least, we have more props on a stick than you can shake a stick at! 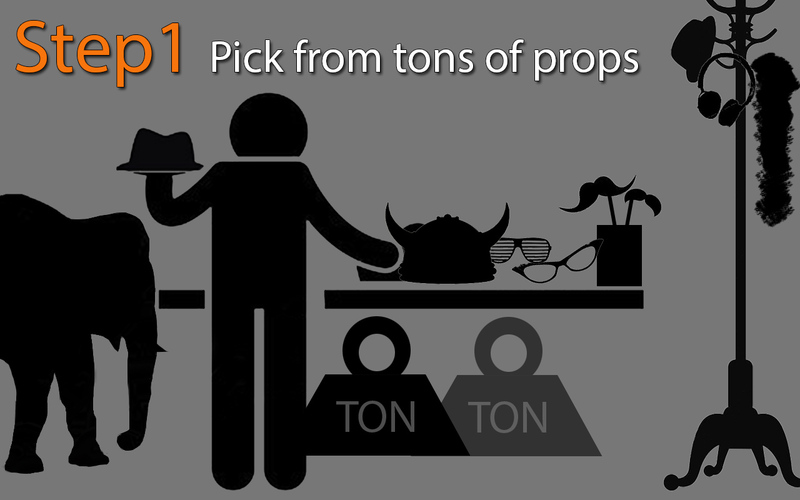 In addition, we made certain that all of our props can be safely handled by children. A flash drive will be given to you at the end of the event with all the photos. A DVD or CD-ROM is also available, if you prefer. Just advise us ahead of time. Book now and receive a USB camera flash drive at no extra charge! This is your party! Let Fotopod Booth bring some bling, elegance, and a touch of Hollywood glamor with our exclusive stanchions and red carpet treatment. A knowledgeable on-site attendant will be there to answer your questions and ensure that everything runs smoothly. Fotopod “Mini” Glowing Soft box Backdrop! Designed for events with tighter spaces and smaller budgets. This professional soft box backdrop comes complete with Fotopod’s dazzling custom LED-illumination experience. Fotopod “mini” measures 7ft x 8ft, and can fit up to 10 guests. On a tighter budget? Book our stylish “STUDIO” Popup Tension Backdrops!